Present state: Demolished - a school stands on the site. Notes: Muswell Hill Station had two side platforms and a substantial brick street-level building on the north side of Muswell Hill at the back of a small forecourt. With the coming of residential development around the station in the early twentieth century a second entrance to the station was opened along a footpath from Duke's Avenue for use at peak times. A lattice iron footbridge spanning the platforms was also constructed close to this entrance. There was a two road goods yard, mainly for coal, on the up side of the line and a single siding on the down side running behind the north end of the platform. Access to the yard was a short distance down Muswell Hill and the yard was at a slightly lower level at its south end. The 1956 map reproduced below shows this siding had been removed and one of the sidings in the goods yard had been realigned. Muswell Hill station was the busiest on the branch and was fitted with a passimeter booking office in 1927. After opening on 24 May 1873 the station closed several weeks later on 1 August after a fire gutted Alexandra Palace. The station reopened on 1 May 1875. There was a further short period of closure between 29 October 1951 and 7 January 1952. 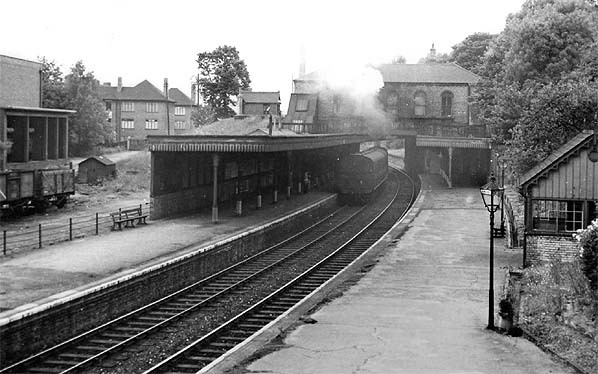 After closure to passengers in 1954 the station remained open for freight traffic until 14 June 1956. 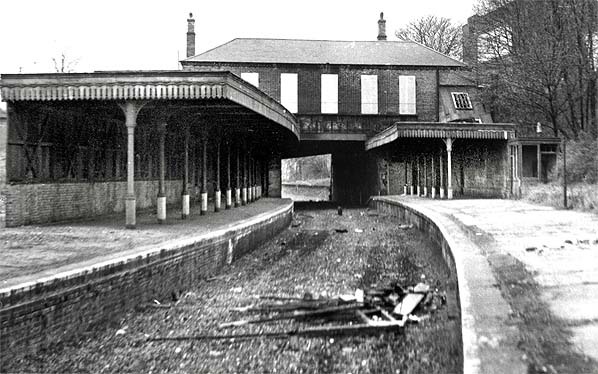 The track was lifted by 1958 and the station buildings were demolished by 1960 when the weight restricted Muswell Hill road bridge was filled in to allow the operation of double deck buses. 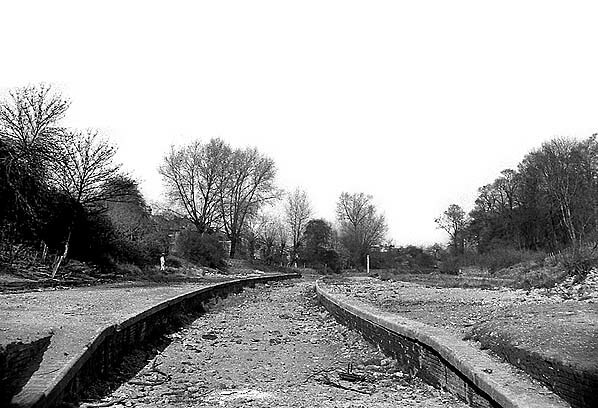 The platforms were demolished c1965. The last passenger train to call at Muswell Hill was the The Locomotive Club of Great Britain (London Branch) Poplar & Edgware railtour on 5 May 1956. As part of the 'New Works' plan to incorporate the Alexandra Palace branch into London Transport's Northern Line a large brick electricity sub-station was built at the back of the goods yard. 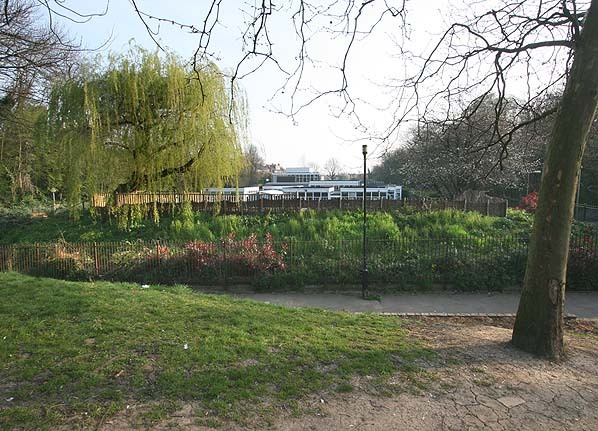 This was fully equipped but never used and was demolished along with the station in the early 1960s when Muswell Hill Primary School was built on the site in the 1960s. There is a feature on the station on the school web site. 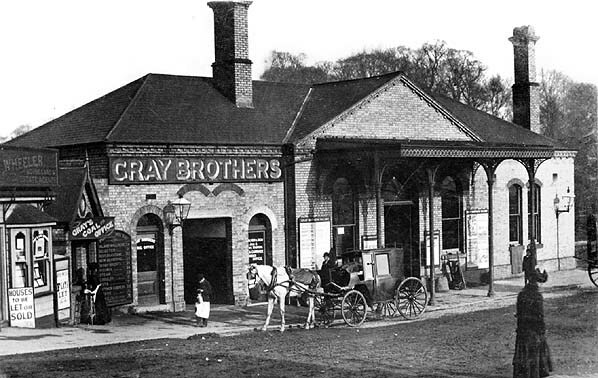 The ‘main line’ between Seven Sisters Road and Edgware proved more costly than expected, and shortly before completion the local company was taken over by the Great Northern who opened the line on 22 August 1867 with intermediate stations at Crouch End, Highgate, East End Finchley, Finchley, Hendon and Mill Hill; but the extension to Watford was never built. On 1 April 1872 the High Barnet branch was opened with the Alexandra Palace branch following on 24 May 1873; the section between Muswell Hill and Alexandra Palace was still owned by the Muswell Hill & Palace Railway although it was worked by the GNR. The Alexandra Palace branch was an immediate success, providing the most convenient route to the Palace from central London, but the services were suspended a few weeks after opening when the palace was gutted by fire and they were not reinstated until May 1875. Despite its initial success, within a year the MH&PR was in financial difficulty as passenger numbers fell dramatically. Several periods of closure for the terminus followed as the GNR failed to attract residential traffic to the line. Suburban growth on the main line as far as Finchley began in the 1860s and a further station at Stroud Green was opened on 11 April 1881. Residential traffic between Muswell Hill and Highgate was also improving, and an additional station at Cranley Gardens was opened in 1902, but Alexandra Palace station continued to be underused. The plan was adopted and shortly before the start of WW2 the lines began to appear on underground maps. It was expected that Northern Line trains would be running into Alexandra Palace by 1940. Work on the electrification and new infrastructure started alongside the steam service which continued to operate. With the start of WW2 the service was once again reduced. Although work on the electrification of the Alexandra Palace branch ceased in 1940 some work continued north of Highgate on the Edgware and High Barnet lines. London Transport had every intention of completing their New Works plan and although several lines, including the Alexandra Palace branch, were shown to be 'under construction' on some underground maps until 1950, work was never resumed. On 3 July 1939 the existing northern line service was extended from Archway to East Finchley where it surfaced alongside the LNER line from Finsbury Park just south of the station. 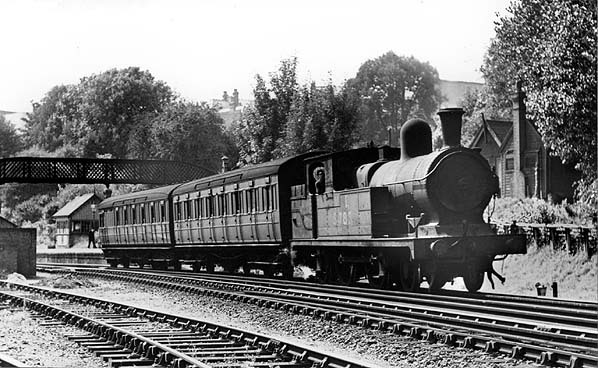 The steam train service which formerly served High Barnet and Edgware was cut back to East Finchley, and after March 1941 all trains were diverted to Alexandra Palace instead; but this improvement in the service was short-lived as all through trains were withdrawn and, once again, a limited shuttle replaced them. Tickets from Michael Stewart except 019 Brian Halford, Bradshaw from Chris Totty. Route map drawn by Alan Young. Muswell Hill station street level entrance c1900. 1893 1:1,056 OS Town Plan shows the layout of the station and goods yard. The entrance to the station is at the back of a court yard close to the top of Muswell Hill. From the street-level building steps lead down to the two platforms, each protected by a canopy at the southern end. A signal box at the back of the down platform controlled access to the goods yard which was behind the up platform; access to the yard was a few yards down Muswell Hill. A weighbridge is located just inside the entrance. A short siding is also seen running behind the north end of the down platform which has been chamfered to accommodate the track. Click here to see a larger version of the map. 1951 1:2,500 OS Map shows considerable residential development around the station. There is also a secondary entrance to the station along a footpath from Duke's Avenue. At this point there is also a footbridge spanning the platforms. One of the two sidings in the yard has been realigned. A substantial coal depot is also shown. Part of the embankment along the east side of the yard has been excavated to accommodate an electricity sub-station; this is also partly on the site of the weighbridge and office. Click here for a larger version of this map. 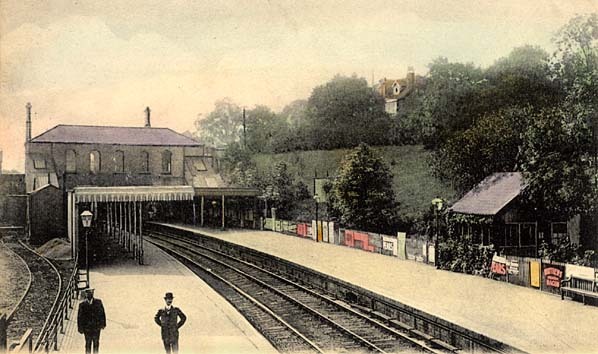 Muswell Hill station looking south c1905; one of the goods sidings is seen on the left. The signal box is seen at the back of the down platform. 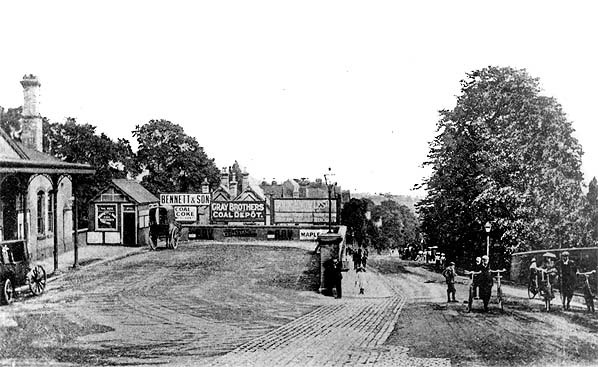 Muswell Hill station forecourt near the top of Muswell Hill is seen in the first decade of the twentieth century. Access to the goods yard was a few yards down Muswell Hill behind the coal merchants' signs. 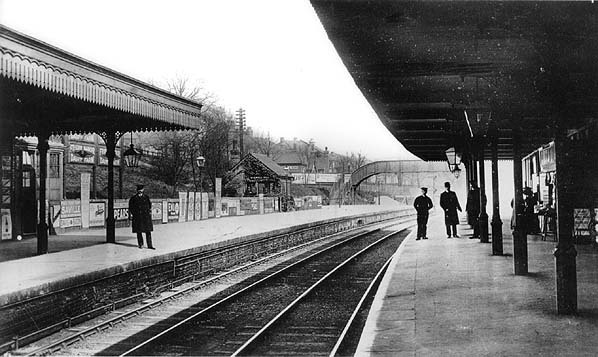 Muswell Hill station looking north c1910. 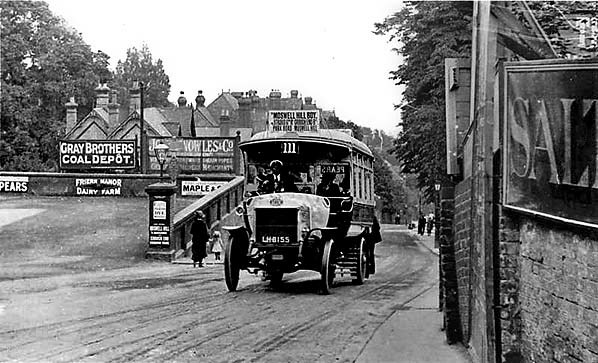 An LGOC single-deck B-type on route 111 is seen climbing Muswell Hill, passing Muswell Hill station in the 1920s. 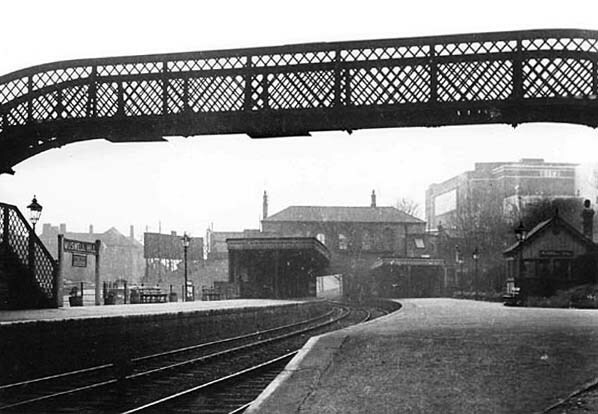 Muswell Hill station looking south c1940; the signal box is seen on the right. The Ritz cinema, which opened in 1937, is seen in the background. A northbound train has just pulled out of Muswell Hill station in 1946. 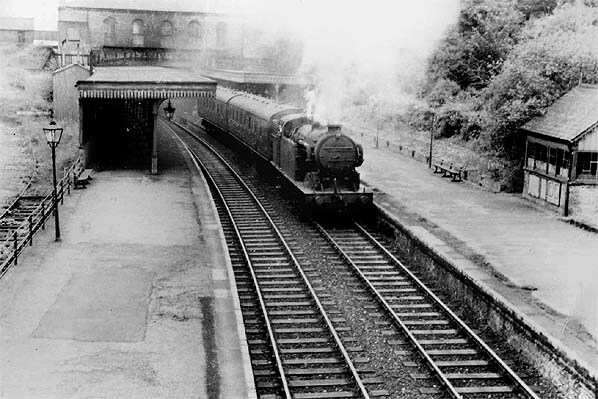 Muswell Hill station looking south in 1954 as a northbound train pulls out of the station. Muswell Hill station looking south along the down platform in April 1958 shortly after the track was lifted. By February 1961 the buildings had been demolished, possibly in 1960 when the weight restricted road bridge was filled in to allow the operation of double deck buses. This view is looking north.